Beautiful late period renaissance shirt with standing rucked collar front and pearl buttons. Three-tiered cascading center front ruffle and sheered long sleeves and in pearl button ruffled cuff. 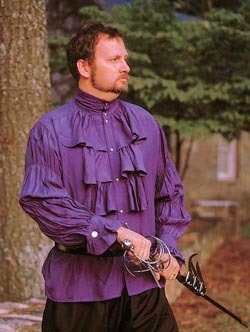 A must for the well-dressed Lord or Pirate. Small, Medium, Large, or Extra Large. Choose purple, black, or white. Cotton blend fabric. Dry clean only.